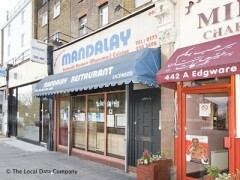 About: Mandalay is a Burmese restaurant specialising in a variety of Burma dishes including Samosa, curry and vegetarian dishes. A takeaway service is available. I took my sons there for dinner, the food was good but I found it was tailored for the british palate, which was a shame having lived in Burma I noticed the difference. My son has also been to Burma for a holiday and also noticed the difference. So busy, but so friendly. A wonderful change from the usual Asian cuisine. Fantastic food, friendly service and excellent value for money.